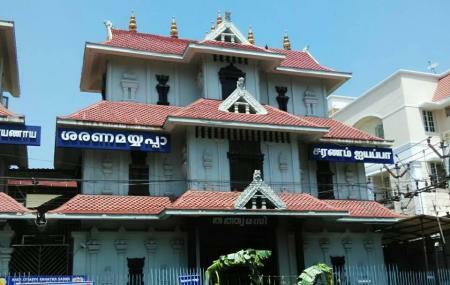 This is the city’s first Ayyappan temple, and thus of high significance. It was some forty-odd years ago, that it was realized Chennai did not have a temple, exclusively dedicated to Lord Ayyappa when the construction of this temple was initiated. The Ayyappan philosophy treads on the philosophy of brotherhood along with universal love, bringing people of the same beliefs together. It’s a brilliant alternative, if you can’t make it to the main temple in Kerala, albeit being just as blissful. How popular is Ayappa Temple? Always an amazing place that is close to my heart. My fav deity, my positive space. Very silent and cooperative staffs. Must visit. Temple Timings Morning 3.30 AM PALLI UNARTHAL 4.00 AM TEMPLE OPENS 4.30 AMMALAR NIVEDYAM 4.45 AM GANAPATHY HOMAM STARTS 5.30 AMvABHISHEKAM 7.00 AM USHA POOJA 7:15 AM SREEBALI 10.30 AM UCHA POOJA 10:45 AM SREEBALI 11:00 AM TEMPLE CLOSES Evening 5:00 PM TEMPLE REOPENS 6:30 PM DEEPARADHANA 8.30 PM ATHAZHA POOJA 8.45 PM SREEBALI 9:00PM TEMPLE CLOSES On January 26, 1970, Sthala Sudhi Pooja was performed at the site by the then Thantri (High Priest) of Chottanikkara temple. A small office room was constructed. Bhajans were being held at the venue every Saturday evening which attracted about 40-50 participants, mainly children from the neighbourhood. A plan for the construction of the temple was got prepared by Sri.Kanippayyoor Sankaran Namboodiri in February 1970 and the civil works were entrusted to engineer Sri.T.G.Poduval. The granite works were executed by Sri Subramaniya Sthapathy. Granite stones for this purpose were specially brought from Pattumalaikuppam. A place where you detach from the rest of the world and find peace within yourself.